The Bullsnake (Pituophis catenifer sayi) is a large nonvenomous colubrid snake that inhabits the south-western areas of Canada. At present it is considered a subspecies of the gopher snake (Pituophis catenifer). Bullsnakes can grow to reach lengths of up to 8 feet 4 inches (2.5 m) although most are sround the 6 feet (1.8m) mark. Adult specimens have been found weighing up to 4.5 kg (9.9 lb) although most top out at around 3.6 kg (7.9 lb). This makes the bullsnake one of the largest snakes native to Canada and the United States, although it is generally not as long as indigo snakes nor as heavy or as large in diameter as rattlesnakes. Usually they are yellow in colour, with brown, white, black or sometimes reddish coloured blotching. The blotching pattern is as follows: large blotches on top, three sets of spots on the sides, and bands of black on the tail. Many colour variations have been found, including albinos and white varieties. A scale count is required to distinguish juvenile Bullsnakes from juvenile gopher snakes. The Bullsnakes diet consists mainly of small mammals, such as mice, rats, pocket gophers, ground squirrels, and rabbits, as well as ground nesting birds, birds' eggs and lizards. Juvenile Bullsnakes depend on small lizards, frogs, and baby mice. Bullsnakes kill their prey via constriction. 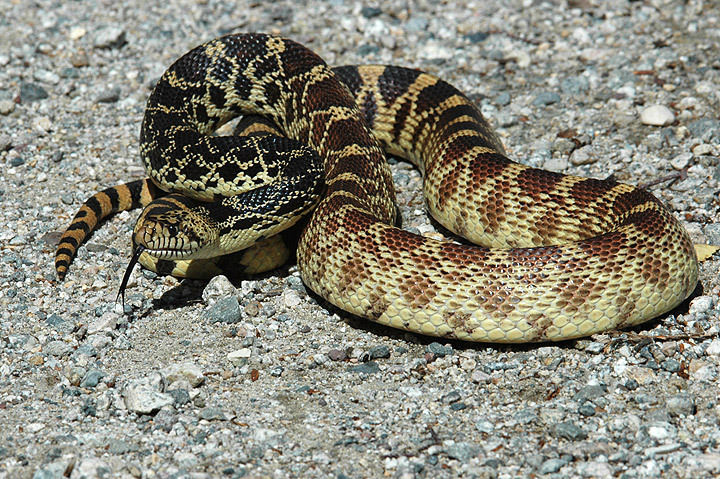 Though most Bullsnakes are usually docile, and with some time become accustomed to handling, most Bullsnakes are quite defensive and known for their perceived "bad attitude". When threatened by anything as large as a human, a Bullsnakes primary defence is to rear up and make itself look as large as possible. It typically then begins lunging and retreating at the same time in order to escape. Click HERE for a Bullsnake care sheet.